Create extra storage space by adding shelving in your under-stairs closet. This functional space will help to keep you organized and to conserve valuable floor space. Whether you install shelving made of wood, galvanized steel, MDF or wire shelves, shelving units will maximize the space in your home by creating a space to store many of your things. Organize your belongings in an under-stairs closet. Store your shoes by installing shoe racks in your under-stairs closet. Rows of shoe racks may be installed in your closet that can hold all kinds of shoes and even shoe boxes. This kind of shelving is different from other kinds, as it's installed with a slight downward slant. Another option for shoe racks is to install nickel or chrome rails. A pull-out shoe organizer may also be installed depending on the depth of your closet. Another option for under-stairs closet shelving is to install a top shelf and two horizontal poles or a single horizontal pole. This kind of shelving allows you to store different kinds of things in your closet. The top shelf allows you to store miscellaneous items that you can stack, such as storage boxes or folded sweaters. Both of the poles are ideal for hanging clothing such as jackets, short coats, shirts and pants. 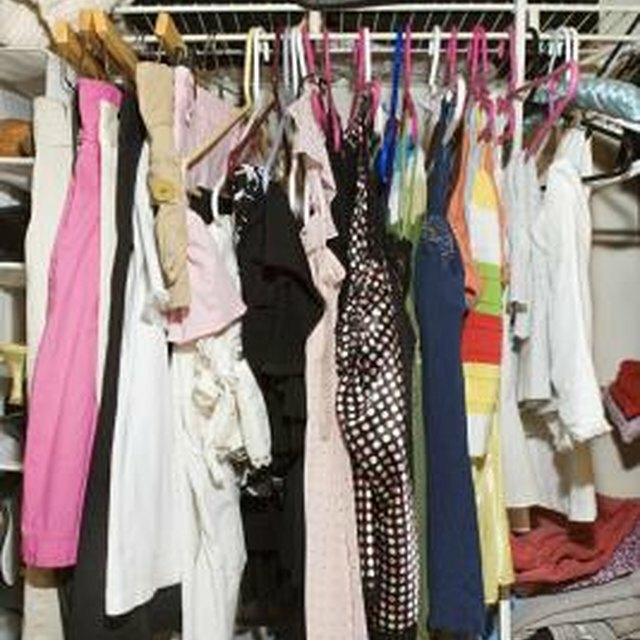 Line your under-stairs closet with multiple shelves, especially if you'll be using it to store items other than clothing. Installing shelves from top to bottom allows you to use the space to keep almost anything, including books, canned goods, small storage boxes, glassware, dinnerware, linens and towels. If the space under your stairs is large enough, shelves may also be installed in a "U" shape to maximize the use of all the walls in the closet.